Makers of mobile apps think that Google’s Android operating system has a better long-term outlook than Apple’s iOS, according to a survey conducted by Appcelerator of the developers that use its app-building tools. 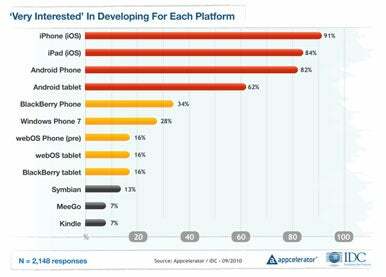 But the news isn’t exactly grim for Apple, as developers polled by Appcelerator continue to be heavily interested in creating apps that run on the iPhone and iPad. Asked by Appcelerator which mobile platform has the better long-term outlook, 58.6 percent of respondents said Android, while 34.9 percent favored iOS. Appcelerator notes that the gap has widened since its last survey in June when 54 percent of those surveyed favored Android’s long-term prospects over 40.4 percent for iOS. The reason for the shift, says Appcelerator vice president of marketing Scott Schwarzhoff, is that Appcelerator’s developers like the flexibility of the Android operating system and the growing number of devices that run it. For example, developers think Android is better positioned than iOS to power a large number of connected devices in the long term by a nearly 3-to-1 margin (72 percent to 25 percent). Furthermore, 85 percent think that Android is the most “open” platform while 56 percent think that Google’s OS has the most capabilities. 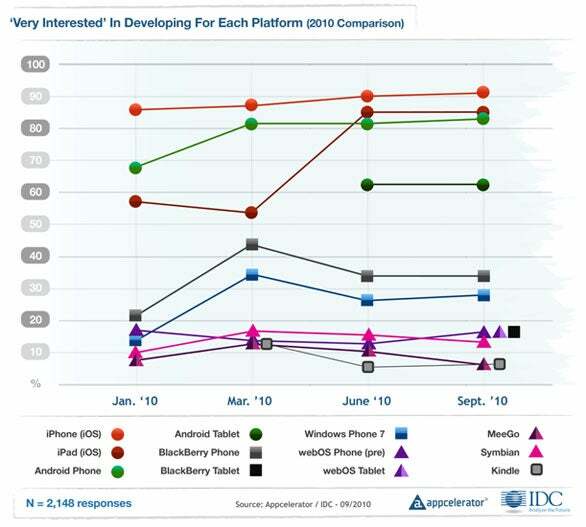 While Appcelerator’s survey results indicate some clear momentum for Android, there’s plenty of good news for iOS. In addition to the 84 percent of developers enthusiastic about making apps for the iPad, 91 percent are very interested in developing for the iPhone—the highest ranked device in Appcelerator’s survey. In addition, developers give iOS the edge over Android for revenue opportunity, market size, and quality of both app store and devices. Android may have a healthy long-term outlook according to Appcelerator’s numbers, but Schwarzhoff concedes that this is not a zero-sum game between the two platforms. If there are people who should be worried by the Appcelerator survey, they’re affiliated with Research in Motion, Microsoft, and HP. Their respective mobile platforms—BlackBerry, Windows Phone, and WebOS—fare poorly when it comes to developer enthusiasm. iOS and Android appear to be benefitting from numerous development opportunities with both smartphones and tablets; other platforms seem to strike the developers surveyed as more limited. Appcelerator makes Appcelerator Titanium, an open-source application development platform aimed primarily at Web developers to help them quickly develop applications for multiple operating systems. Appcelerator says that more than 4,000 apps have been written with its Titanium offering. This latest survey polled 2,363 Appcelerator Titanium developers and was conducted with the help of market-research firm IDC. (IDC is owned by International Data Group, which also owns Macworld.) The survey was conducted from September 14-16.